Retail sales of pet medications were up 2% in 2013, reaching $8 billion, including sales through veterinarians, brick-and-mortar retailers and online, according to a report from Packaged Facts. This figure reflects a compound annual growth rate of 7% during the 2009 to 2013 period, according to “Pet Medications in the U.S.: Over-the-Counter and Prescription Remedies as Consumer Products, 3rd Edition,”from the Rockville, Md.-based market research publisher. Growth in the overall pet medication category is attributable to the strength of several new product introductions, the return of Novartis products to the market, as well as continued strength of non-flea and tick drugs in the veterinary channel. George Puro, president of Puro Market Research and the author of the report, says he is surprised the market didn’t grow more. “This was largely because of the highly competitive landscape and because of a cold winter and spring last year,” Puro tells Marketing Daily. Products for dogs accounted for majority of pet medication sales, at 77%, with cats representing the remainder. Most marketers of pet medications in the U.S. slot into two groups: global pharmaceutical companies operating through animal health divisions and selling mainly through the veterinary channel, such as Merial; and pet product marketers selling through retail channels, including broad-line marketers like Central Garden & Pet and smaller companies focusing on over-the-counter pet health products. With the recent and ongoing cross-over into retail of formerly vet-only brands like Bayer’s Advantage and K9 Advantix, the pharmaceutical/veterinary vs. pet product/retail distinction is blurring, however. For many companies, antiparasitics are a key part of the pet medications portfolio, with flea/tick products representing their best-known consumer brands. For marketers, there are three important factors to consider, Puro says. The first is what’s known as the human/animal bond between pet parents and their pets. “Pets are part of the family, and you’ll spend on them like you would on any family member,” he says. Second, the biggest flea and tick brand, Merial's Frontline, has come off patent, and competing marketers have been trying to capture market share. Third, pet medications are increasingly moving out of the veterinary channel and into retail. All of these factors have led marketers to try to tailor their marketing messages to pet owners. Still, veterinarians are the ones prescribing pet meds and clinics remain the largest sales channel by far, so marketing to this channel is a critical part of the marketing mix as well, he says. Pet medications sales will experience healthy returns through 2018, Packaged Facts projects. The market will grow from its 2013 level to more than $10 billion in 2018, reflecting a CAGR of 5%. As always, the biggest wildcard will be the weather for flea and tick sales. But as new products emerge in the coming years, the industry should be poised for healthy growth, says Packaged Facts Research Director David Sprinkle. 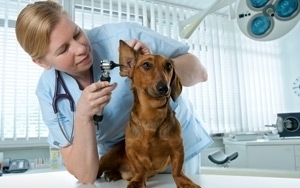 "Veterinarian examining dog" photo from Shutterstock.